A "food literacy program" where art, food, agriculture, and community food politics intermingle. 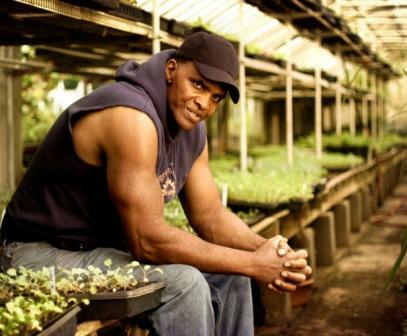 “The Secret Life of Plants” was a “food literacy program” that took place at Denniston Hill’s permaculture demonstration garden and greenhouse. This series explored what lies beneath the surface of what we consume sensually. Performances, lectures, workshops, and screenings underscored the connection between humans and their food sources by engaging audiences with issues that are at the heart of agriculture and consumption. At the heart of “The Secret Life of Plants” was an interest in connecting people with the spaces and processes by which life in the 21st century is produced. Specifically, we wanted to put residents of Sullivan County in touch with their food sources and stimulate a community dialog about the personal, economic and social benefits of nutrition and agriculture. The series reflected Denniston Hill’s mission to explore new ideas about sustainable development that can be generated through artistic practice. 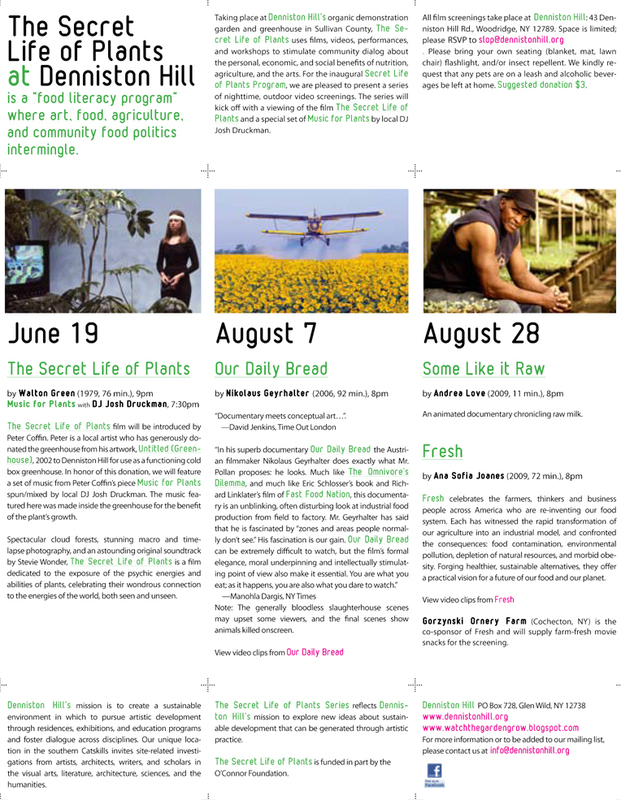 The programming included outdoor screenings of the documentary films “Fresh the Movie,” “Some Like It Raw,” “Our Daily Bread,” and, of course, "The Secret Life of Plants”. Films were hosted by filmmakers and guest speakers who moderated discussions following the films, and matinees were directed at younger local residents. One matinee screened Catherine Gund’s “What’s on Your Plate?,” a film that is narrated by two young women of color as they ask questions and come to understand their place in the food system. The screening was followed by a children’s workshop that introduced young people to some of the social, political, and economic issues that underlie the production and consumption of food in Sullivan county. Co-sponsorships with local farms, activist organizations, and food businesses exposed audiences to the diversity of food production in the Sullivan-Delaware-Otsego-Broome-Schoharie-Chenango-Greene- Ulster counties region. The series directly addressed two main local problems, the dearth of local nutritional education and the fractured nature of community in the area. Although Sullivan county is a rural county with many working farms, most residents of the county are not aware of the quality of local produce or the benefits of supporting local agriculture. “The Secret Life of Plants” sought to educate local communities about the origin of the food they eat, how it is cultivated, and how many miles it travels from farm to fork. It introduced local communities to innovative sustainable food system practices like permaculture, home gardening, green markets, and community supported agriculture (CSA) programs. It showed how these practices are good for the environment, help struggling farmers survive, and provide healthy, affordable, locally grown food to communities, especially lower-income families. Co-sponsored by the O'Connor Foundation.